Microsoft Word is now much more powerful. 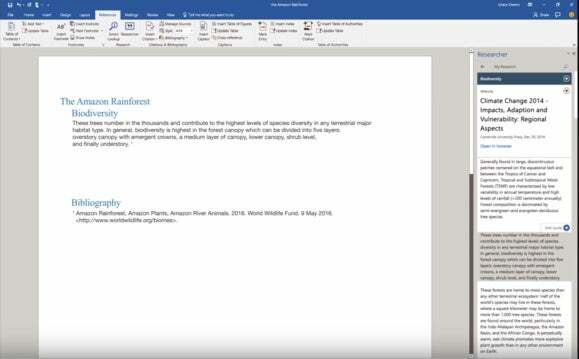 Microsoft Word is slowly becoming an A.I. powerhouse. The app, which has existed in one form or another since 1983, can now look for word choice problems, weak language, passive voice, and many other writing problems. The new feature, called Editor, appears in a window on the right hand side. Anyone with an Office 365 subscription can use the new update -- just make sure you select the Fast Insider option in settings. It's part of a major update for Office 365. I started testing Editor this morning after hearing about the addition. One of the most interesting additions in some time, even in the history of the popular app, the machine learning can examine your prose on the fly. For example, if you keep using the words “maybe” and “possibly” it will flag those as weak words. If you use casual nouns and verbs, including those that would not pass a test for basic business writing like “cushy” or “comfy” you’ll see a dark underline for those words. When the Editor flags something, you can then quickly right-click and select an alternative, if one is available, or research the suggestion more and see explanations in the Editor window. I could see someone new to the business writing field using this app to help improve their writing. For those who have been writing for decades, it’s a good reminder or can help flag mistakes and smooth and massage your text. The machine learning looks for context and phrasing. For example, you might use the word “really” to emphasize a term, but Word will flag it as unnecessary. Yet, if you weave the word into a different sentence -- starting with the word followed by a comma or a question mark, for example -- Word might ignore it. Passive voice seems to come up the most. The app will flag phrasing like “was surprised” but, in my testing, I usually had to think of a way to reword the sentence myself -- usually by picking a stronger noun and verb construction. “Bob surprised me” is better than “Bob was surprised” because it’s clearer and more direct. Active voice is one of the signs of good writing; many of the “contributed content” articles you read, some of them submitted by folks trying to sell a product, are in passive voice. I could see these features expanding into other apps. In Microsoft Excel, for example, I’d love to have an A.I. assistant that suggests different ways of formatting or calculating cells. Even in Microsoft Edge, an A.I. could help with writing emails and even web searches, or could flag sites known for distributing malware. An A.I. could pop up in just about any software program, from Adobe Photoshop to Apple Logic X on a Mac. For now, I’m thoroughly impressed with how the Editor in Microsoft Word works -- I’ve been waiting a while to check it out with longer documents and see if I can improve the flow in my writing. In one case with an extremely long document, I managed to cut out about 100 words by choosing some of the alternate suggestions. The ones that helped the most were usually related to passive voice and weaker words. What this new direction teaches us is that we may be able to let our apps do more of the work someday. We might not have to type at all -- a bot will let us dictate. We can let the AI handle the complexities of removing obvious errors. We can focus on being creative. At the same time, it says something about us as well. Maybe we are asking for too many shortcuts -- who knows? I'd prefer students didn't rely too much on this tech. If you try it, I’d love to hear your feedback -- did it help you write better prose, did you cut out some extra words? Drop me a note -- just make sure you remove passive voice.